From Analog to Standard Definition (SD-SDI), to High Definition (HD-SDI), 3G-SDI, to 4K/UHD with HDR/WCG Video (WFM/WVR8x00), Optical SDI (WFM2300) and HDMI with HDCP interfaces (WFM5250). 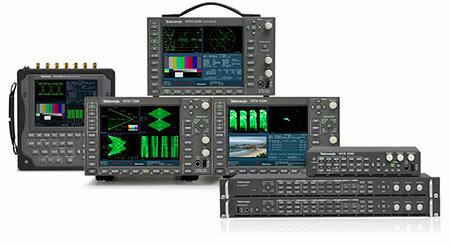 Tektronix waveform monitors provide a wide variety of video format support and can also include support for Analog, Digital and Dolby audio formats. You can choose a basic waveform monitoring platform or a fully field upgradeable waveform monitor that will allow you to extend your monitoring and measurement capabilities as your business requires. Available waveform monitor tools such as Physical Layer Analysis including options to measure 3G-SDI eye and jitter, comprehensive analysis of ANC data, simultaneous input monitoring and Audio-Video Delay measurements help you solve challenging problems more efficiently. Tektronix is the worldwide leader in Waveform Monitors and Rasterizers, offering the most complete line from portable measurement to 4K production. Find out more information by selecting your waveform monitor or rasterizer by product series.